It�s a long shot at best. 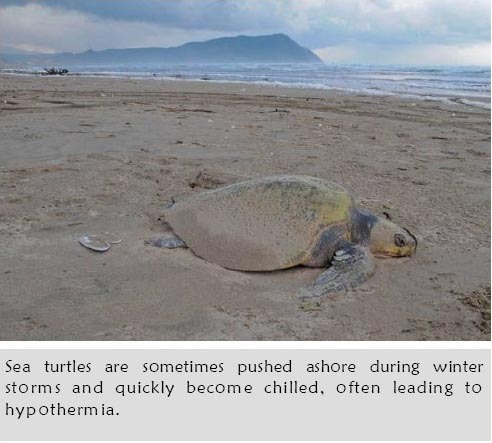 By the time giant sea turtles are discovered on windy local beaches, they are usually hypothermic and can barely move. These cold-blooded creatures were simply not built for the Pacific Northwest�s cold, windy, wet winters. Their arrival is accidental. Sea turtles riding the warm California Current out at sea are sometimes pushed ashore by winter storms. In the colder near-shore waters and wind, their body temperatures drop rapidly and they begin to suffer from hypothermia. If they even make it ashore, their chances of survival are very low. Olive Ridley�s turtle, was discovered partially buried in the sand in Gearhart. Both were retrieved and transported to the Seaside Aquarium. 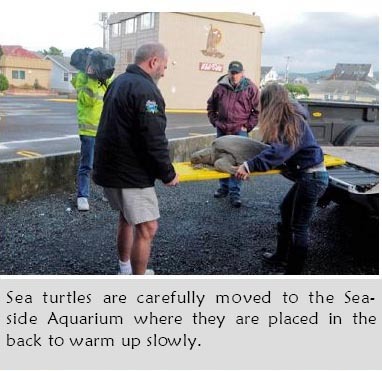 The Seaside Aquarium is not equipped to rehabilitate sea turtles; it takes them in and starts the delicate process of warming the animals while another aquarium, usually the Oregon Coast Aquarium, comes to retrieve the turtles. If rehabilitation is successful in a venue like the Oregon Coast Aquarium, the turtles are then sent to a facility in Southern California and released into the wild. There are many steps in the process, and the animals are often very sick, but the occasional success makes the effort worthwhile. After removing a turtle from the beach, the next step is to warm it up. If this is done too quickly, the turtle will go into shock. 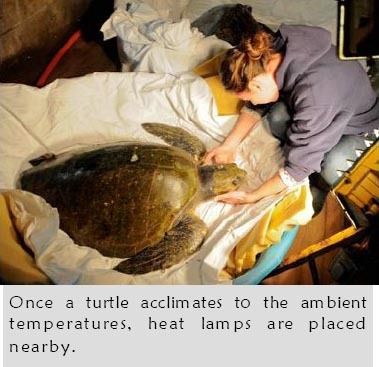 Turtles are placed in a sheltered, unheated area until they adjust to that temperature and then are slowly heated. This process can take hours. Although turtle strandings are not common, winter storms bring a few sea turtles ashore each year. 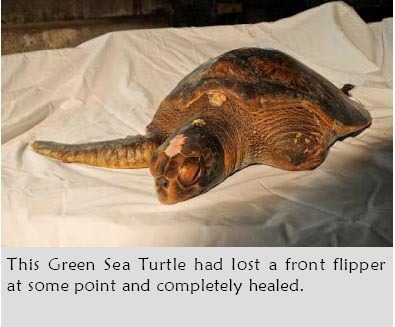 Green Sea Turtles are the most common, but occasionally Olive Ridley and Loggerheads also wash ashore.